Precision Drilling thinks that North American shale drilling will continue to be in growth mode for years, and it's making an audacious acquisition to prove it. For a company to acquire another business at a low point in a cyclical industry is typically applauded by investors over time, but in the moment, it can look like a brazen move with industry prospects at its gloomiest. 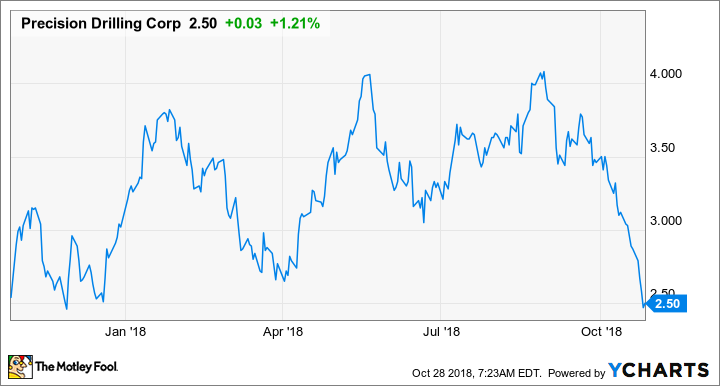 In Precision Drilling's (NYSE:PDS) case, its recent acquisition seems even bolder when you consider that it has a high debt load and, on the surface, looks like a takeover candidate itself. This move is very much a bet that shale drilling in North America will go on strong for years to come, and Precision thinks this acquisition will allow it to reach its most important goal sooner: debt reduction. Let's take a look at the company's most recent quarterly performance to see if the business is in a position to make this kind of move and what investors should make of the situation. DATA SOURCE: PRECISION DRILLING EARNINGS RELEASE. EPS = EARNINGS PER SHARE. 1 CANADIAN DOLLAR (CA$1) = $0.76 AT THE TIME OF THIS WRITING. On paper, it would appear that Precision didn't do as well as the same time last year, even though earnings and operating income improved. The big difference between this quarter and this time last year was that the company had a larger tax bill (or more specifically, it had a lower amount of deferred future taxes) that led to the larger net income loss. Operationally, this was another quarter of slow but steady progress. Revenue was up 21% compared to this time last year thanks to its contract drilling services deploying 16 additional rigs to its U.S. onshore operations. Management even noted that the contracts it signed in the quarter were for significantly higher dayrates, which should help drive better revenue and margins in the coming quarters. Perhaps more importantly than Precision's earnings this past quarter was the announcement that it was acquiring Trinidad Drilling for a total transaction value of 1.03 billion Canadian dollars, assuming CA$477 million in net debt from Trinidad. The all-share deal would make Precision a 71% owner of the combined company and would make it a top three rig company in the U.S. as well as owning 30% of the Canadian drilling market. Management estimates that, upon closing the deal, it will shed about 50 rigs from its fleet to focus on its higher-specification rigs in both Canada and the U.S. Also, Precision estimates that Trinidad's rigs can be easily integrated into its standardized design and will make upgrades to the combined fleet rather easy. Trinidad's shareholders have to approve the merger because there is also a competing bid from Ensign Energy Services, though, so it's by no means a done deal. The real concern is whether this is the best time for Precision Drilling to be making an acquisition. After all, the company still has a burdensome debt load that is well above its peers. That's saying something in a capital-intensive industry like this. Management says that this will help improve its finances and will allow it to accelerate its debt repayment schedule, but we won't know that until we see it happen. As part of the company's press release, CEO Kevin Neveu discussed some of the benefits for shareholders of both companies and why the current offer makes sense both from a price and strategic standpoint. We stand behind our Board-supported agreement to combine with Trinidad and remain firm that our offer of 29.1 percent of Precision shares to the Trinidad shareholders is fair, offering far more value creation upside than other available options. We believe the combined company will create significant value for both Precision and Trinidad shareholders with immediate cost synergies and strong strategic fit. Additionally, the incremental free cash flow generating potential of this combination will support Precision's ongoing long-term debt reduction targets with potential to accelerate our stated timeline. The combined platform, particularly the 61 Trinidad high specification AC rigs and enhanced U.S. and international exposure, improves our fixed cost leverage and market presence in those key markets. We are in the process of completing required regulatory filings and will provide updates as new information becomes available. Precision's decision to acquire Trinidad is a daring move for a couple of reasons. One is that the company is buying a competitor at a time when it has a high debt load. Management seems to think that this acquisition will help to accelerate its ability to pay down debt, but we'll believe it when we see it. Also, the timing of this acquisition could sting as oil and gas producers are slowing their drilling demands in the U.S. because of crude oil transportation bottlenecks and exhausted 2018 capital budgets. Other oil services companies have noted that there is a lot of white calendar days for the rest of the year, and that could lead to a quarter or two of declining results at a time when Precision can ill afford it. If the deal does work out, the way management seems to think it will, however, then this could be a game-changing transaction done at a very weak point in the cycle. Being able to quickly pay down some of its debt obligations and start returning some of that cash to shareholders would go a long way in making Precision Drilling a more attractive investment, but we're still a long ways off until then.